Cascading block and tackle system: 2:1 wire or single-braid line cascade with 4:1 fiddle block & tackle. 2 x 2 x 2 x 4 = 32 to 1. This 32:1 rigid vang system is very powerful but slow. Each inch that the top of the cylinder moves in or out requires 32 inches of line moving through your hand. 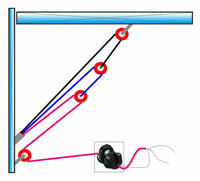 8:1 cascade system—mechanical advantage of 2 x 2 x 2 with two “floating blocks”. Twist control for the mainsail: Downwind, the vang prevents the top of the main from twisting excessively, which causes the upper section of the sail to be under-trimmed or luffing, and the lower part to be over-trimmed. Too much twist makes the boat unstable, since the forces generated by the sail’s top and bottom sections are oriented in radically different directions. Not only is an excessively-twisted main slow and inefficient, but it causes the boat to roll and possibly to gybe accidentally, a nasty and potentially unsafe surprise. In a dinghy such as a Laser, sailing downwind with the vang overly eased will cause a dreaded capsize to weather known as a “death roll.” Our Traditional Boom Vangs provide essential safety and twist control for cruising boats. 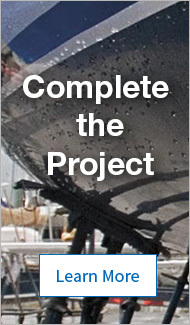 Install a couple of boom bails or firmly-attached eye straps, and clip the vang in place. It can be easily removed when the wind is light. Support for the boom: A vang can make a great support to hold the boom up when you lower the sail, so you don’t need to attach a topping lift line or wire to the boom’s aft end. Rigid vangs, like the Forespar Yacht Rod, provide this support with an internal spring. The Boomkicker is a clever fiberglass spring device that is simple to add to small-boat vangs that use block purchase systems. Control of the mainsail leech: tightening the vang tightens the leech of the sail, hooking the battens to weather (like putting the flaps down on an aircraft wing). Easing it dials twist into the sail, opening the leech and reducing heel and weather helm. Vang sheeting: a vang with plenty of power helps control mast bend, so the mainsheet only adjusts the angle of the sail. Bending the mast de-powers the sail and opens the leech. Vang sheeting works well in gusty conditions where you need to ease the main in a puff, since the mast will not spring straight (and increase the sail’s fullness and power) just when you need less drive. Mechanical advantage or purchase, how much power a vang system can apply, is created in two ways. Tackle systems multiply power by running line or wire through single, double, triple or fiddle blocks. 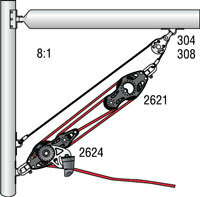 You can calculate the mechanical advantage of a tackle system by counting its parts. For example, a three-part tackle system, using a single block and a single block with a becket, divides the line in three parts for a mechanical advantage of 3:1. Cascade systems like the 8:1 cascade system shown here, use a chain of single blocks to successively double the purchase. Lots of purchase is good, but the system needs enough throw, range of motion, to cover the entire range of travel needed. Sometimes a gross-fine tune system works well for vang and mainsheet systems, allowing long throw-low power adjustments at one end of the tackle, and short throw-high power fine-tuning at the other end. Friction is the enemy of effective adjustment with any powerful system, so ball bearing blocks gain importance when you install powerful vangs. Laser sailors understand the amazing improvement in user-friendliness that transpired when the class upgraded from a terrible 3:1 plain-bearing vang to wonderful 15:1 Harken or Holt systems. Now younger, older and smaller sailors can actually make the vang system on a Laser work, and we are even allowed to use ball bearing mainsheet blocks! Ball bearing blocks make any vang work better. 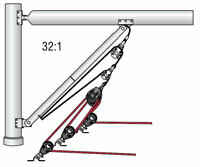 Double-ended controls, shown in the diagram of the 32:1 system, can be arranged to lead the control lines right to the rail and be the ultimate in convenience.